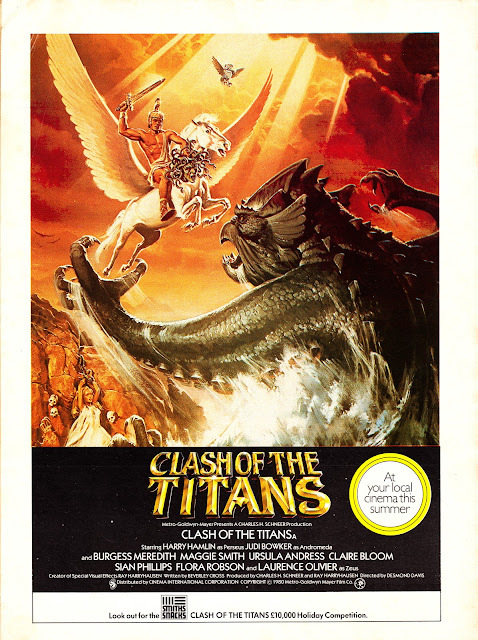 This print campaign, promoting the Ray Harryhausen stop-motion epic*, appeared in UK comics cover-dated August 1981. Note how purveyors of corn-based bagged snacks Smiths have snuck-in on the deal: plugging a COTT-related holiday competition. Details of which, presumably, appeared on packs. *We're continuing our "Titans" coverage although, obviously, this has nothing to do with the similarly-named Marvel UK weekly we've been banging on about for the last few posts.